I've looked all over the forum and web, but can't seem to find an answer to my exact question. I bought a 2003 G35 Sedan used several years ago. The headlights have the "haze" and "cloudiness" on them. I've tried everything to get them clean (mothers, maguars, etc) and can't get them clean. I think the haze is on the inside and there are some scratches now as I've tried so much to clean them. So, I need to replace them. I "think" I have Xenon headlights as they have the bluish look, but since I didn't buy the car new, I have no way to tell. I don't want to replace with Xenon headlights if I don't have to as they are much more than halogen. Will replacement Halogen work on my car? Um.... If your car is currently set up with Xenons then I would say no Halogens wont really work. The back plug in spot is totally different. Also, If you have haze problems and the headlights are turning yellow, then switching to Halogens is like a step down and you wont see well at all. I dont exactly understand what you are asking fully. Are you buying new headlights? The headlights are hazed beyond repair. From what I have read, I have to get a whole new headlight assembly. 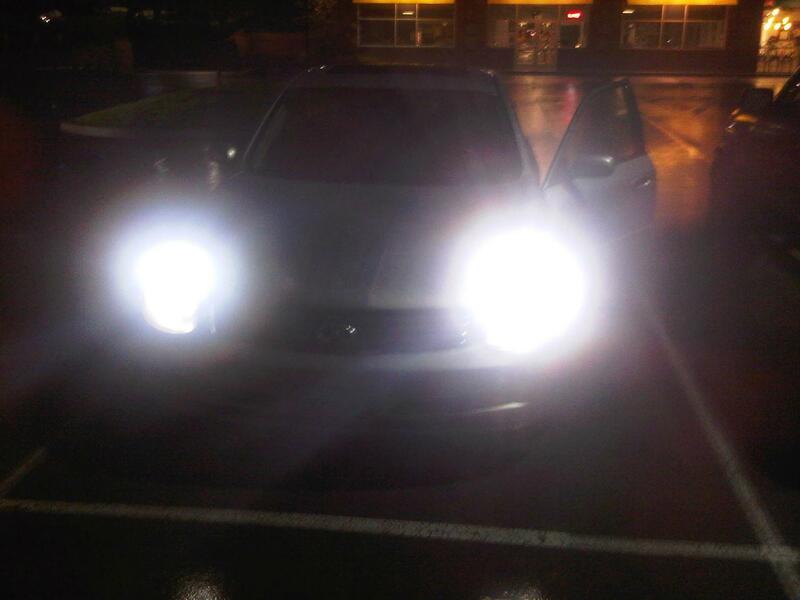 There is nothing wrong wit the lights themselves, just the headlight "cover" is so dang hazy I can't hardly see. Also - is there a way to tell if I have Xenons or Halogen? yes there is a way to tell. Do you have a ballast or not? Also snap a pic and we can help. Will snap a picture once it stops raining here. Where would the ballast be? Can I see it without removing the headlight? Im not sure. Honestly I would say stick to xenons. Here is the photo. Xenon are 2x to 3x the price. Yes, you have xenon head lights. Yes, the halogen headlight assembly will fit. The HID bulbs that you currently have will not fit in the halogen headlight assemblies, but you can get aftermarket HID's that will fit. The only difference in the Xenon and Halogen assemblies is the brackets for the bulb to go into. The assembly itself is the exact same size and uses the exact same mounts. but apparently i can only find them in halogen. Does anybody have any suggestions for me? Can i find a similar set that are HID? Is there a way to make my HID bulbs fit in this housing? or does anyone know for a nice set of HID's for an '04 x which i can add halos too? Hello M. Bohn. Do you have a part number or bulb size that will fit into the Halogen assemblies? HID XENON HEAD LIGHT BULB 8000k D2R for Infiniti G35 2003 2004 2005 Crystal Blue. Do I need any additional parts? If the ballast isn't connected then you need to buy a ballast to provide HID quality Power. On most budget HID upgrades they are included. Send a link. Look up ChrisFix's video on wet sanding and clear coating headlights. Does a full restore. In your case, you might wanna use a 600 grit, 1500 grit then a 2000 grit. Keep that **** wet as hell or you're going to have to repair deep scratches. Gets rid of oxidization and haze. I have a 2003.0 G35 sedan with the factory HID xenon option. I just bought the 03-04 Spyder Auto projector headlights which are not compatible with factory HID. What do I need to do, to make them fit?